This listed house was rebuilt in about 1780. It is constructed in brick, and has a Kerridge stone-slate roof with a stone ridge. The rear wall is in sandstone. The house is in three storeys, and has a three-bay front. At the top of the building is a fluted frieze under a projecting cornice. The doorway is flanked by ionic columns, and the windows are sashes. 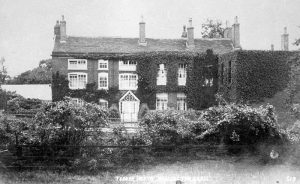 When they first came to Bollington Samuel and Mary Greg lived in Turner Heath House on Bollington Road. Francis Greg is listed as living here in the 1892 Kelly`s Directory. The house is next door to Rookery and that is where George Antrobus lived while he developed various mills in Bollington. When Philip Antrobus junior died in 1829 he left a small works at Turner Heath consisting of a warehouse, dye house, weaving shop, and steam engine. Samuel Greg, of Lowerhouse Mill, came to live at Turner Heath in 1832. He established the first Sunday School in an out-building and gave land for Bollington Cross school. In 1892, according to Kelly`s Directory, Sarwel Arnold a shopkeeper lived in some part of Turner Heath. And in 1896 John Alfred Wanklyn also lived here. Also listed is John Eardley who was a farmer. 1901 census William Bradley aged forty eight years a calico printer from Bollington lived with his wife Isabella Ann aged forty nine years from Liverpool. They had four daughters between fourteen and twenty nine years, all were cotton weavers. Also on this census, on the very next page is another Turner Heath on the same road. Presumably one of them is Turner Heath Mill but it is not clear which is which. The occupiers of the second house were Harry Chadwick aged twenty nine years, a cotton weaver from Bollington, his wife Emily aged twenty eight also from Bollington and Arthur their 1 yr old son. 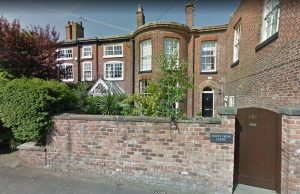 Also living there was Emily`s Mother and Brother Jane Stringer aged fifty seven years and Arthur James Stringer a blacksmith aged twenty six and from Bollington. In the 1914 Kelly`s Directory Isaac Needham is registered as living at Turner Heath. Historic England – listing information .